N-ti have lots of new arrivals on their website including tops, skirts and hijabs. Aab have a flash sale on with 25% off accross their website when you enter the code FLASH72 at the checkout. Ends Friday 2nd December 11:59pm GMT. 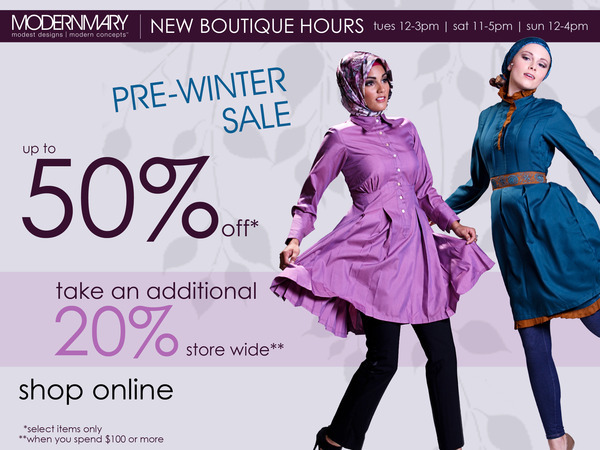 Modern Mary have a pre-winter sale on with 50% off selected items. Plus get another 20% off when you spend $100, with the code FALLSALE20. Ends Friday 2nd December 11:59pm ET. Zeena have a sale on with upto 30% off selected clothing. And from now until Sunday 4th December, they're also giving 15% of their proceeds to The Global Fund in support of World Aids Day.